The final entry above records the burial of Thomas Tyldesley 1657-1714, the Diarist, on 26 February 1715 (FN2). His first wife, Eleanor Tyldesley née Holcroft, had been buried on 7 November 1693. 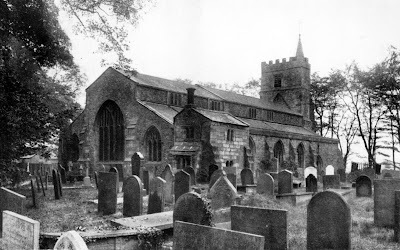 One of their daughters, Ann, who died in infancy was also buried at Garstang—on 21 June 1686. Of the other nineteen burial entries, sixteen are specifically stated to relate to the Stansacre branch of the family, an offshoot of which was later to be found in Bury St Edmunds. The three remaining entries concern Edward Tyldesley 1635-1685, father of the Diarist. Edward's first wife, Anne Fleetwood, is buried on 10 March 1667, his son Edward on 1 June 1679 and a daughter Beamand (FN3) on 20 April 1683. 1. Lancashire Parish Register Society, Vol 68, 1931. 2. Until 1751 in England and Wales the year started on 25 March – Lady Day. Hence what is referred to in the register as February 1714, is what we would understand to be February 1715. 3. This birth, ignored by both Gillow and Hewitson and Lunn is of some interest. Does it result from the surname of Edward's second wife, Elizabeth Beaumont? In any event, it means that Gillow and Hewitson and Lunn were clearly wrong in suggesting that there was a single child of this second marriage, namely Catherine Tyldesley.